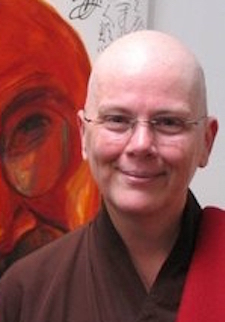 Bhiksuni Ani Drubgyudma is a fully-ordained nun, a Bhiksuni, of the Vajrayana tradition. She is a Dharma teacher. Bhikkhuni Drubgyudma is known for her deep insight, great vision and fruitful efforts. She founded and directs the Flower Dance Temple and Bear Paw Monastery in upstate New York, USA. As an abbess she directs the spiritual practice of female and male practioners is the cultivation of wisdom and compassion at her wilderness monastery. She teaches her students to hear the cries of the world and to respond. As such she founded and also directs the Sisters of Compassionate Wisdom which is an organization of Buddhist women as she sees Buddhist women’s need for companionship and assistance world-wide. Her practice community is solitary, and communally supports the development of the four-fold Buddhist Sangha, and protects all sentient beings and living things in their forest sanctuary. Bhikkhuni Ani Drubgyudma and her followers believe in the healing benefits of a life amidst nature, and therefore make “wilderness practice” or forest meditation as a peace offering to this world.